Anywhere people are walking dogs can be a source of heat and light by introducing a Methane Digester into the equation. As long as people are walking dogs and throwing away dog poo, a flame can burn. 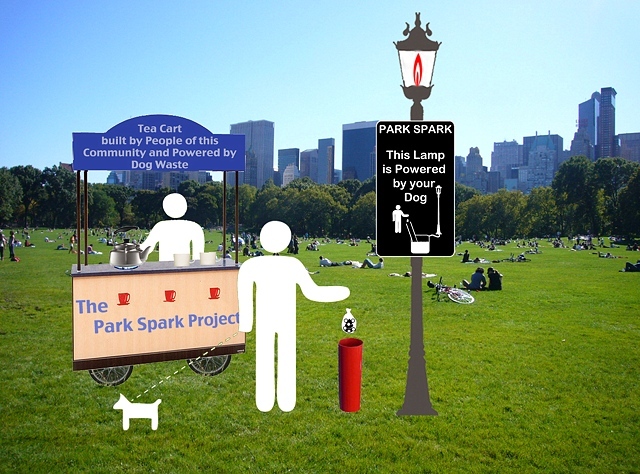 The Park Spark project is the transformation of dog waste into energy (methane) through a publicly fed methane digester as an interactive urban intervention that questions our current waste system, and at the same time creates an opportunity for others to participate in the (re)imaging of the byproduct energy (methane). The Park Spark project is a digester (see "HOW IT WORKS" section), which can be above-ground or buried underground except for a tube and a hand-crank, so that people can feed the digester and stir the mixture inside. Learn about the environmental benefits of burning methane and how to "green" your park.